One of the foods that I discovered as an adult was apple butter. It’s something I look forward to every fall! I’ve always wanted to make it, but I had a very specific idea in mind on what I wanted. I wanted to make an apple butter, in the slow cooker, that was sweetened with only a tiny bit of apple cider. 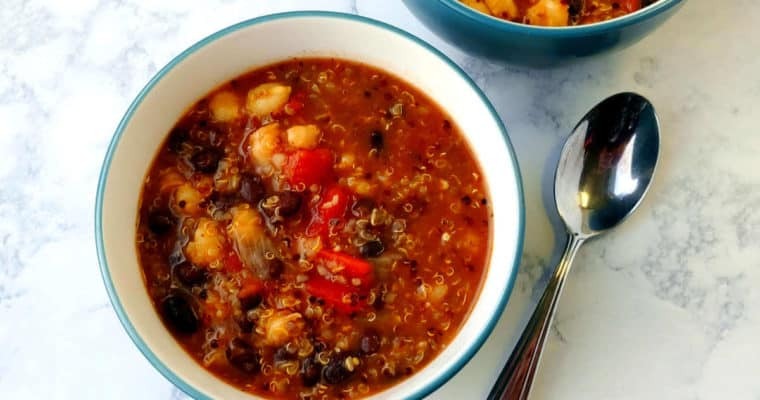 Easy, delicious, and healthy. When we lived in Champaign, Illinois, I would go to Curtis Orchard every fall. It was just on the outskirts of town, about a 10 minute drive. (Much closer than the 30+ minute drive I’ve had in St. Louis and New Jersey!) I’d walk through the orchard, pick some apples, and then go into the shop area and browse. I loved picking up a jar of apple butter. It was thick and sweet and perfectly spiced. When I became more health-conscious, I started getting the no-sugar-added apple butter. Instead of adding sugar, they use apple cider instead! Yes, this still adds some sugar, but at least it’s not refined sugar. Being the cook that I am, of course I wanted to make apple butter at home. I tried a few recipes while we lived in Illinois. One was much too sweet. One was much too spiced. And then, as life went on, I stopped experimenting. We moved from Illinois; my trips to pick apples became fewer, and I made other things. I’ve made a point of apple picking with Amelia over the past few years, and I enjoy looking in the farm shop/bakery when we go. But apple butter is crazy expensive! Even the sugar-added kind. I can’t bring myself to pay a lot for something that I know should be easy and inexpensive to make at home. 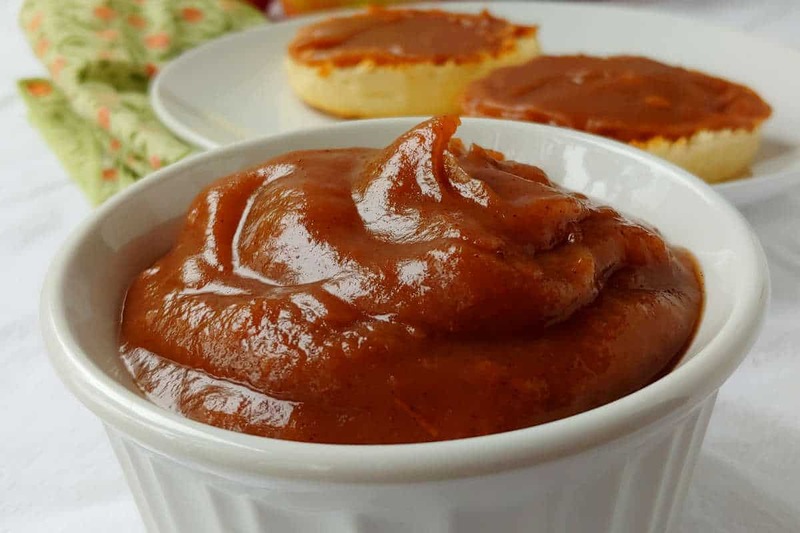 Apple butter is basically apple sauce that has most of the water cooked out from it. It’s thick and spreadable. The apples caramelize as they cook down, adding a delicious extra flavor to appley goodness. You can start from fresh apples or from applesauce. I prefer starting with apples. You generally add sugar to it to sweeten (and preserve) the apples. It will usually keep for longer than applesauce. In my experience, apple butter is usually spiced. So, making apple butter is a (delicious) way to preserve fruit. One way in which it differs from jam, jellies, and preserves in that there’s no pectin added. 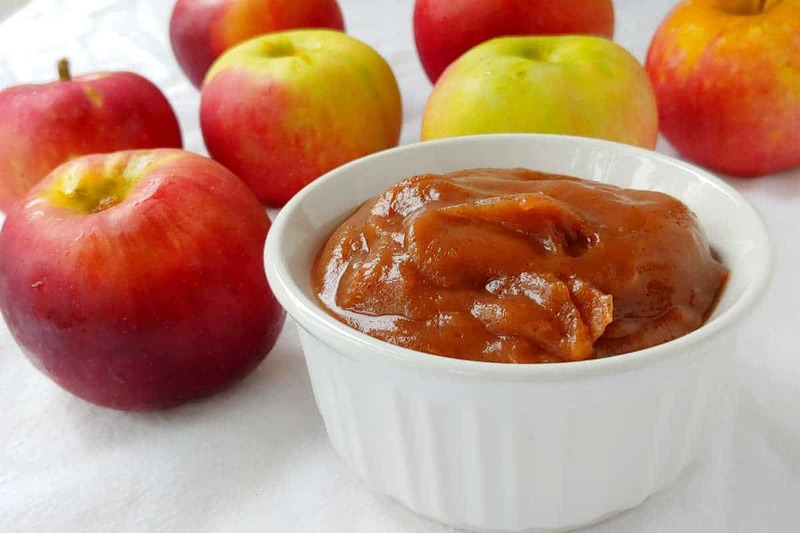 It’s really easy to make apple butter at home! Chop up some apples; add a little cider and spices; cook for a while in a slow cooker; blend; cook a little longer in a slow cooker. The apples cook way down before you blend them, and then cook down further. Then you’ve got 2+ cups of apple butter, ready to eat! 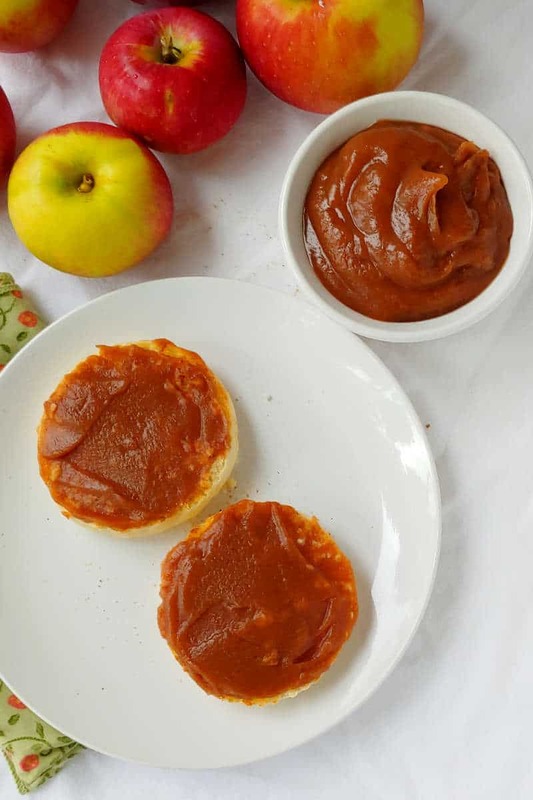 Now, there’s several ways to make apple butter at home. You can make it on the stove, in a pressure cooker, or even in the oven if you’d like. But the slow cooker or Crock Pot is the way to go. It takes very little babysitting. When I set out to make apple butter, I had 3 requirements. It had to utilize the slow cooker, be practically hands-off, and use a small amount of cider for sweetening instead of tons of sugar. I couldn’t find a recipe that did exactly what I wanted. So I had to create my own. 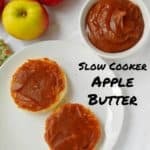 I started with the cooking directions for apple butter from this slow cooker recipe from the Kitchn and adapted from there. Many recipes take granulated or brown sugar or honey as sweetener, but I wanted one that used cider. When I initially looked, I couldn’t find one that only added cider. So, I used the ingredient proportions from this slow cooker recipe from Detoxinista, but replaced the water with cider instead. I liked that her recipe had minimal spices, so I used them as a start, but swapped out ginger and cloves for nutmeg and allspice. 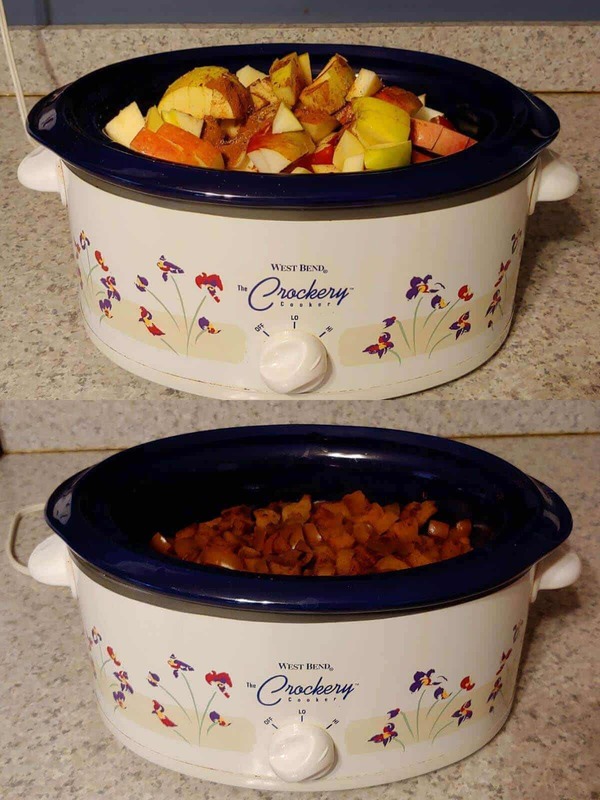 Next, you toss the apples with a little cider and some spices in the slow cooker. You cook it on high for 5 hours (or low for 10), then puree the mixture. Next, you leave the lid off or only partially cover the slow cooker and cook for another 2 hours on high. I really, really didn’t want to have to leave the lid off of my slow cooker, but the batches I tried with the lid on at the end didn’t thicken. Cooking it covered on low gave me very delicious apple sauce. Cooking it covered on high worked better, but the results were still a little thin. Leaving it uncovered was magic. I covered my slow cooker with a mesh splatter guard (affiliate link) so it would let the steam out, but would protect me and my countertops from spattering and popping apple butter. If you leave the lid ajar, covering the opening with a thin towel would probably do the trick. Or just plan to not be near your slow cooker for a few hours, and prepare for a mess. What kind of apples should you use for apple butter? Something that cooks down and softens easily. Think Fuji, McIntosh, Cortland, or Jonagold. My favorite batch was actually composed of only Fuji apples, but experiment with a mix or variety of apples. Try not to use very tart apples. If your apples are very tart, you may want to try adding some extra cider (or sugar, if you don’t mind that); however, extra cider will add more liquid, which will then have to be cooked out. Apples that I enjoyed eating out of hand for being a little tart made for a tart-ish apple butter. If your apples are very sweet, you can add water instead of cider; this will add zero extra sugar or calories to your apple butter. I expect you could also try unsweetened apple juice, or orange juice for a twist. 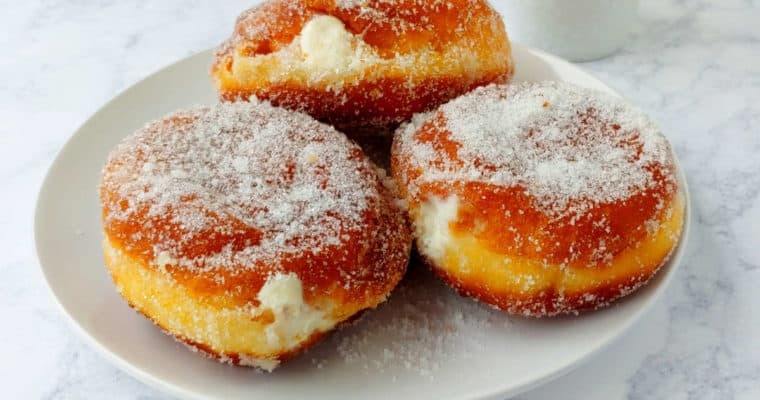 The beauty of this recipe is that it doesn’t use added sweetener aside from the cider; however, you could add brown sugar, honey, or maple syrup to taste if you’d prefer. Artificial sweeteners like sucralose should also work, but I would personally add them to the final cooked product. 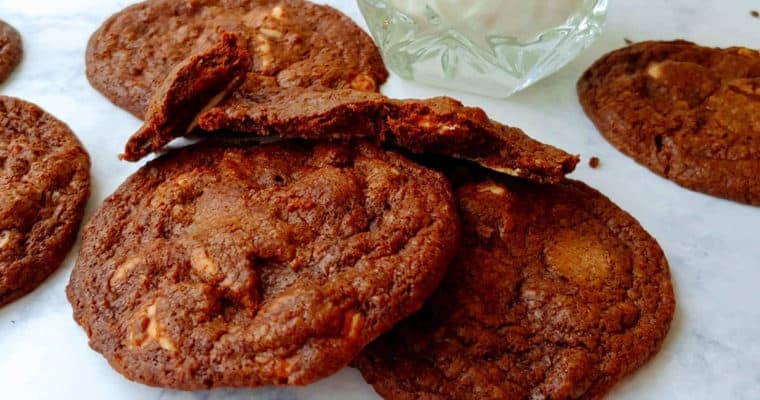 You can use whatever spices you want, but I think cinnamon is a requirement. Otherwise, nutmeg, cloves, allspice, and dried ginger would all be fine additions. I prefer minimal spice in mine. I grate my own nutmeg when I need it because pre-ground nutmeg has no flavor, but I used relatively fresh pre-ground spices for the cinnamon and allspice. 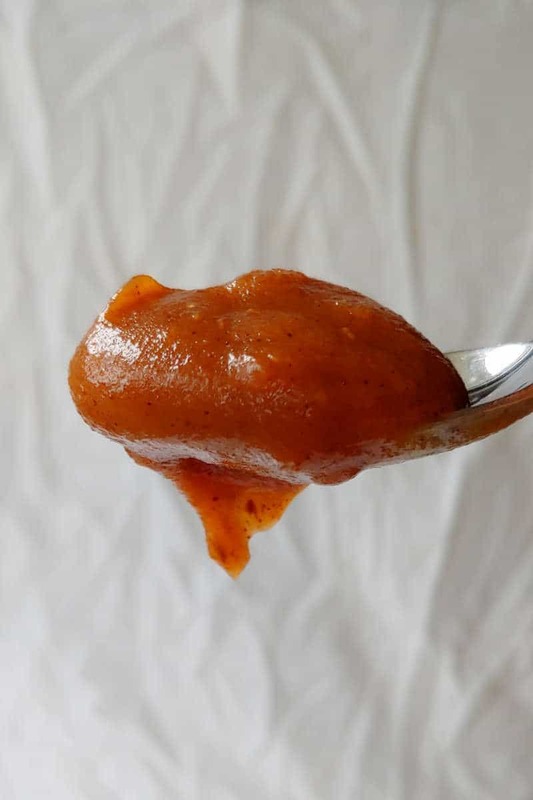 If your apple butter seems too sweet when you’re done, or not as flavorful as you’d like, you can try adding a tiny splash (maybe a teaspoon?) of lemon juice or orange juice to try to balance and brighten it. 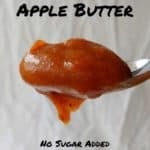 Can I Can Sugar-Free Slow Cooker Apple Butter? There’s some debate online as to whether or not you can preserve sugar-free apple butter via canning. As I haven’t tried canning myself, I would defer this question to canning experts. If you’d like to try canning it, check with a canning resource that you trust. Many state universities have extension offices or food science departments, whose resources include things like gardening, canning, and food preservation and safety. What Can I Serve Apple Butter With? I am a huge fan of apple butter on toast. This apple is so good that I’ve been eating it straight from the spoon, too. I also love it on English Muffins. 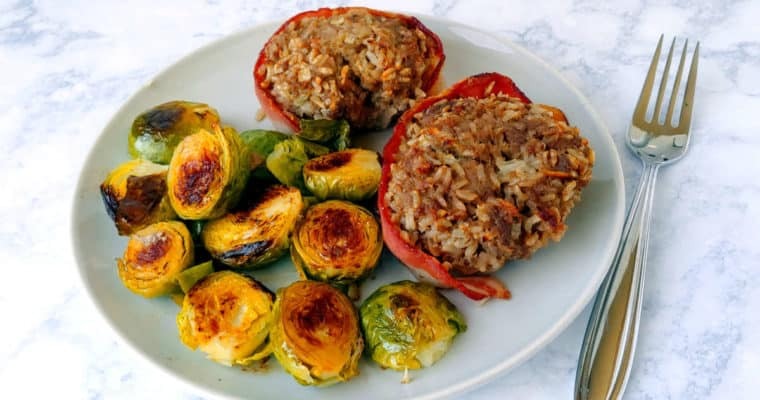 It’s also nice in oatmeal (how my husband eats it), and you could serve it alongside pork chops if you wanted to go a more savory route. Want more apple recipes? Try Fresh Apple-Cinnamon Scones (update coming soon! ), Apple and Pear Scones, Apple Galette, Apple Cider Donut Cake, Caramel Apple Pie, and Apple Pie Bars. 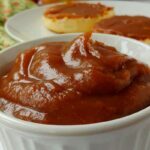 A thick and healthy, no-sugar-added, slow cooker apple butter sweetened with only a tiny bit of apple cider! 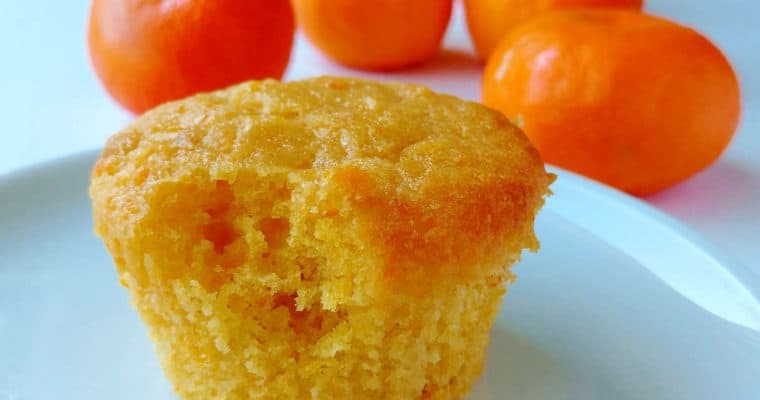 Easy to make, it has just 5 ingredients! Core and slice apples. Peels do not entirely dissolve into the apple butter, but peeling is optional. Peel if desired; I never bother. 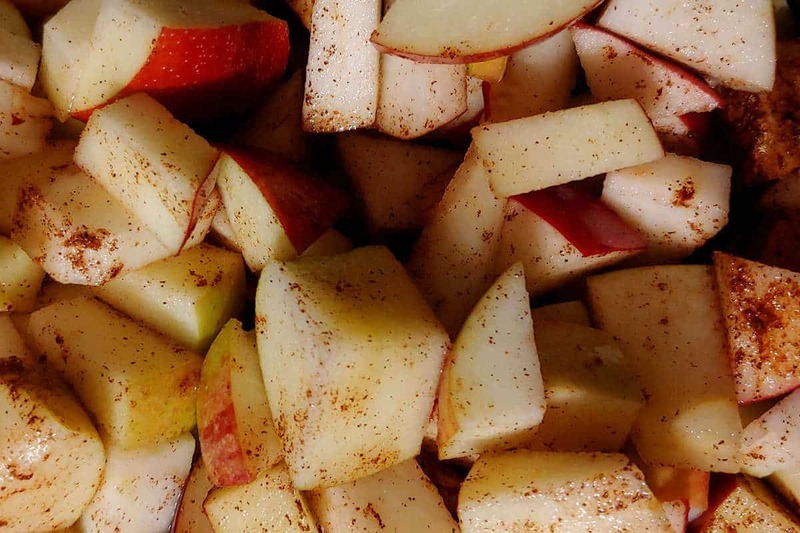 Combine apples, cider, and spices in a 4-quart slow cooker. It will be very full. Cook on high for 5 hours (or low for 10). Do not replace cover. Instead, leave lid off or ajar. Cook on high for another 2 hours, until mixture has thickened. (If leaving the slow cooker uncovered, cover instead with a mesh splatter guard. If leaving it partially covered, cover the opening with a towel you don't mind getting messy, because apple butter will splatter.) Stir after an hour if you're concerned about your apple butter burning. Stir apple butter, then scoop into jars. Store in the refrigerator for up to 2 weeks. Use soft apples that will cook down, like Fuji, Cortland, or McIntosh, rather than baking apples. 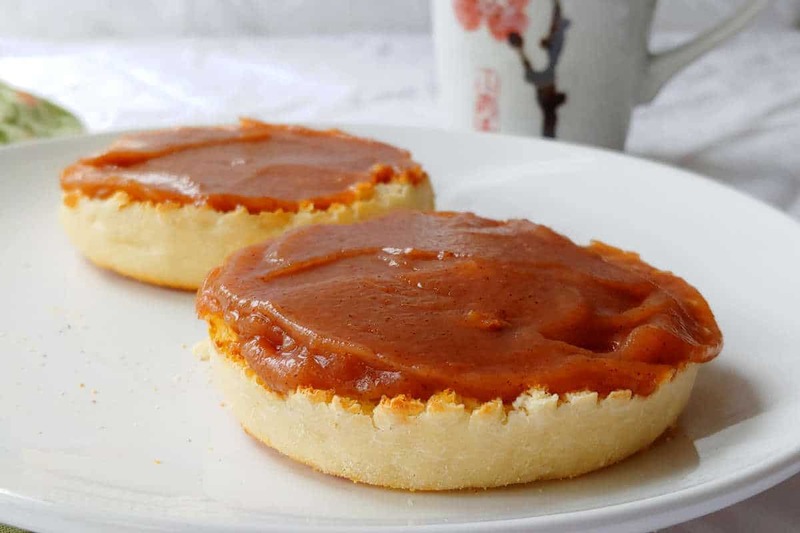 If your apples are tart out of hand, your apple butter may be tart. Adjust the amount of cider you add, or add a mix of apples instead of just one kind. If your apple butter is too sweet, add a dash of lemon juice or orange juice to taste. If for some reason your apple butter isn't thick enough, simmer it on the stove for a few minutes to cook out some moisture. Or, enjoy it as super-delicious applesauce. This recipe was adapted from the Kitchn and Detoxinista.